A select group of men will sit down for dinner inside the Augusta National clubhouse on Tuesday. You cannot book a table, it's by invitation only, but you must wear a green jacket. The champions dinner, or Masters Club as it officially known, sees the illustrious group of former Masters champions gather ahead of the first major of the year to welcome back the latest recipient of the aforementioned famous winner's green jacket. Ian Woosnam will be wearing his as he once again takes his place on golf's top table and this time he may even take a selfie. "What's one of them?" queried the 56-year-old 1991 champion who admits to a dabble now and again on Twitter. "Not sure I'll be allowed to do that, but I might sneak one in! "The dinner's fantastic, you've got every winner there - the likes of Jack (Nicklaus), Arnold (Palmer), Gary Player and all those legends. "Everyone wears their jacket. You can sit where you want but I always sit next to Bernhard Langer as we're creatures of habit. It's been 23 years since Woosnam won what turned out to be his first and only major. Wales' greatest golfer sank the biggest five-foot putt of his career on the 72nd hole after a fascinating duel with two-time champions Tom Watson and Jose Maria Olazabal. "The memories are always there, it's like going into paradise. You drive into Magnolia Lane and the hairs come up on the back of your neck. "I'm very lucky in the fact that I can go back and play the tournament for the rest of my life, but it's going to be difficult. "This will be the first tournament of the year for me and although I've not got any pressure on me there's always that embarrassment factor. "I don't want to go there and shoot 85s, my ambition is to make the cut." And that will be no mean feat for the 2006 Ryder Cup captain who has been plagued with back trouble throughout his career. He last made the cut in 2008 and knows that the brutally undulating 7,435 yards which await him - that's nearly 500 yards longer than when he won in 1991 - are going to be a victory in itself. "If the course has a little bit of run on it then I'll be OK, but if it's wet and you don't get any bounce then it's going to be difficult for me. "It always comes down to how I putt and I just haven't putted good enough to make the cut in the last few years." So the chance of Woosnam replicating his victorious fist-pump look slim, bookies offer odds of 10,000-1 but at 125-1 his fellow Welshman and the current European Tour Race to Dubai leader Jamie Donaldson offers much better value. "It's fantastic to see Jamie doing so well at the moment. He draws the ball well and that's important on this golf course. "He's gone up to the next level. I'll try to catch up with him and give him a little bit of advice - I'm always here if he wants to give me a ring." Donaldson, 38, is helping to put Wales back on the golfing map after many lean years. His unbeaten form in the EurAsia Cup followed on from a second placed finish at the WGC - Cadillac Championship, with many tipping him to take Woosnam's crown as Wales' top golfer, but don't tell that to the old master yet. "Not having Tiger (Woods) there means that it could be a big chance for someone to win a major. If they keep pulling out then maybe I'll have a chance." 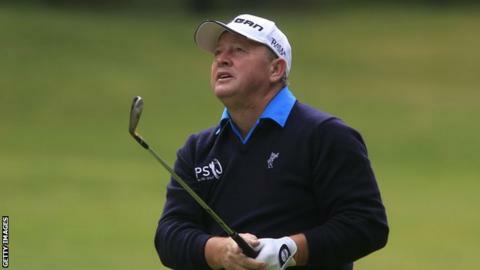 Ian Woosnam was talking to James Pontin ahead of a special Masters preview on Radio Wales Sport, Thursday, 10 April at 19:00 BST.